Bashundhara Group Chairman Ahmed Akbar Sobhan (second from left) and India’s Gulshan Super Group Chairman Chandra Kumar Jain (second from right) at agreement-signing ceremony on Monday. Bashundhara Group and India’s Glushan Super Group signed an agreement in Dhaka on Monday to set up two precipitated wet calcium carbonate manufacturing plants for producing low- cost paper in the country. The products of these two plants would be used as raw materials for paper production. This will create positive impact on environment, including forest resources. 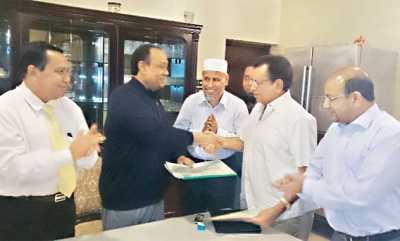 The agreement was signed by Bashundhara Group Chairman Ahmed Akbar Sobhan and Gulshan Super Group Chairman Chandra Kumar Jain. Present on this occasion were Bashundhara Group Senior Deputy Managing Director Belayet Hossain, Deputy Managing Director Mostafizur Rahman, Project Chief ABM Yasin and Gulshan Super Group Director AK Bhat and local representative of Gulshan Super Group Abdus Salam.